Designed by teachers to tie in with the National Curriculum, our jigsaws come with a unique Lifetime Guarantee to warm the hearts of many a frustrated puzzler � free replacements for any lost pieces! 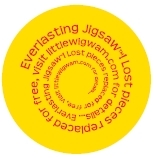 Although these beautiful jigsaws are fully recyclable there is no need to ever throw away a puzzle simply because a piece has been lost, Little Wigwam will happily post a replacement piece for any Everlasting Jigsaw before you have time to pull your hair out! How Do I Get A Replacement Piece? Simply send us a stamped addressed envelope and details of the piece you need replaced - there is no charge! How Do I Explain Which Piece I Need? We don't hide behind silly conditions and disclaimers - no proof of purchase is required, if you have the jigsaw you have the same Lifetime Guarantee! Simple!